Spicy Pecan-Crusted Sweet Potato Balls are seasoned, mashed sweet potatoes formed into balls, rolled in a spicy egg white mixture, then coated with pecans. Grain-free and gluten-free. Do you find the specials as irresistible as I do in the grocery store the week preceding a big holiday? It doesn’t matter if nobody is coming to my house for dinner. Who can resist sweet potatoes for 33 or even 59 cents a pound? Consequently, I find myself with an overabundance of sweet potatoes around Thanksgiving. It’s a great problem. 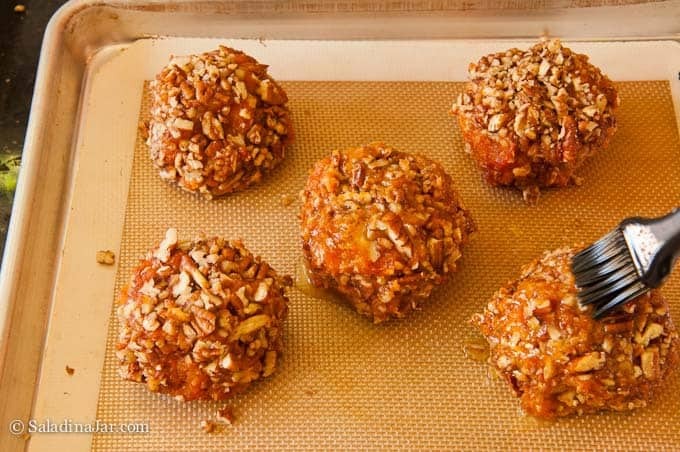 Several years ago, my friend Debbie came to the rescue with her recipe for Sweet Potato Balls. After making it her way for a few years, I completely revised the recipe. You may have noticed how I like to do that. 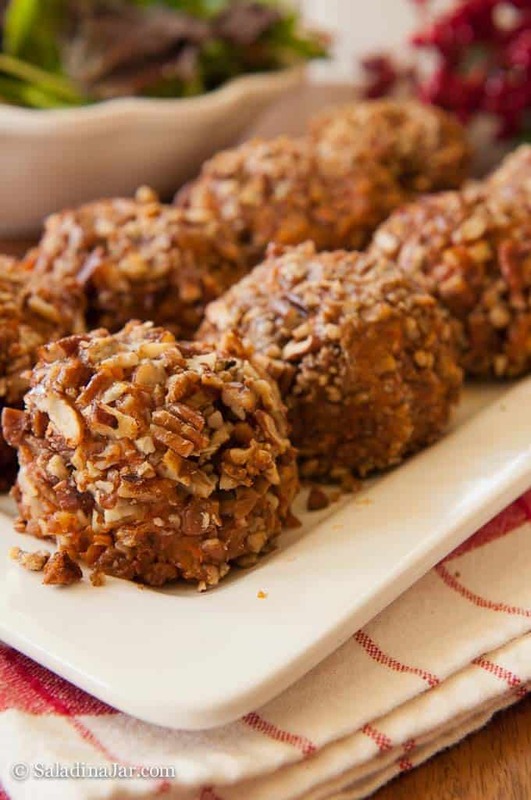 What Makes These Spicy Pecan-Crusted Sweet Potato Balls Special? 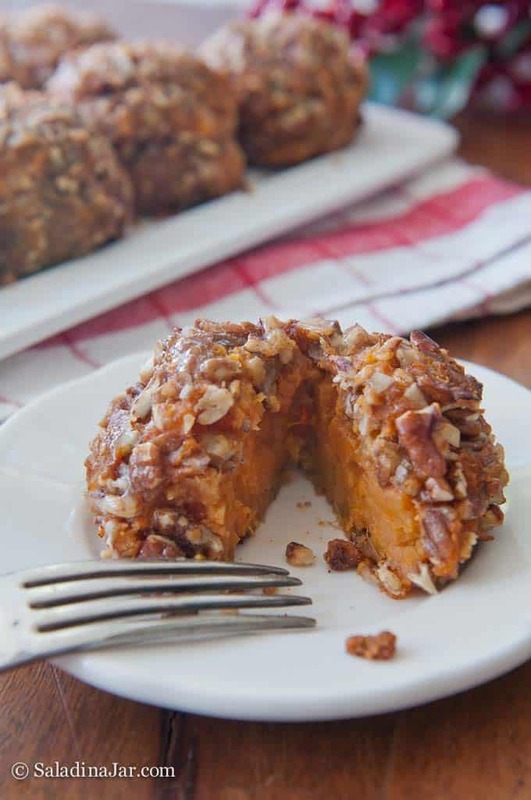 The technique for cooking the sweet potatoes comes from the Nov-Dec 2018 issue of Cooks Country. It’s a simple task on top of the stove but results in a rich and concentrated sweet potato flavor. Marshmallows seem to find their way into many sweet potato casseroles served around the holidays, but I finally decided to say “no” to vegetable desserts. 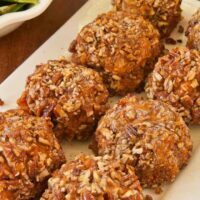 Instead, I use a little bit of Swerve (but you can use sugar or your favorite sweetener) to get the slightly “sweet” flavor in the sweet and spicy pecan coating. The “spicy” notes come from Worcestershire sauce, paprika, and cayenne. Admittedly, these sweet potato balls are a little trouble. Luckily, you can do most of the work ahead of time. Prepare balls and bake at your convenience. When cool, wrap sweet potato balls well and freeze. Allow to thaw and reheat in the oven before serving. Slice peeled sweet potatoes into 1/2-inch pieces. 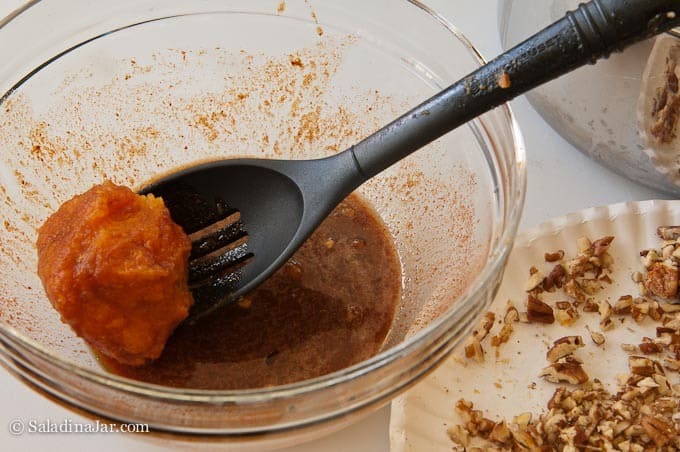 Add 6 tablespoons water and sweet potatoes to medium pot and cover. Cook on medium-low for 25-30 minutes, stirring occasionally until potatoes are soft. While sweet potatoes cook, make egg white dipping mixture. Start by whisking egg whites, salt and water in a small bowl until frothy. 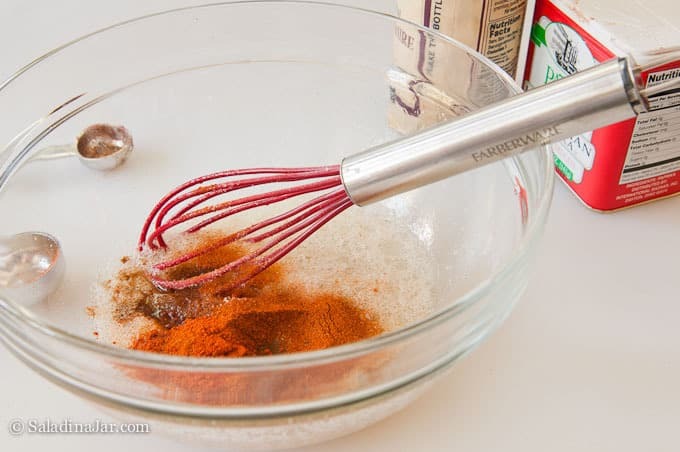 Add spices and whisk again. Form balls between 1/4-1/2 cup size. I like to use a spring-loaded ice cream dipper and wear surgical gloves. 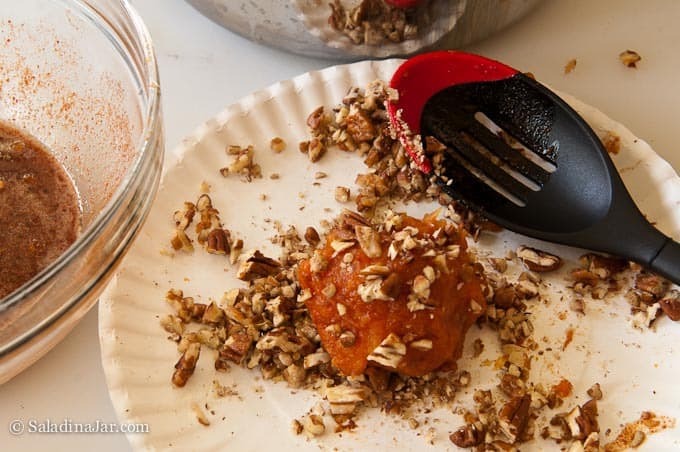 Use a slotted spoon to dip each sweet potato ball in egg white mixture. Place balls on a prepared baking sheet. Brush with butter. Bake at 400 degrees F 15-20 minutes. 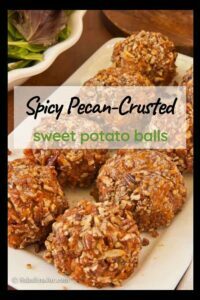 These mashed sweet potatoes are formed into balls, rolled in a spicy egg white mixture, and then rolled in chopped pecans. They are a delicious make-ahead alternative to marshmallow, butter, and sugar-laden sweet potato casseroles. 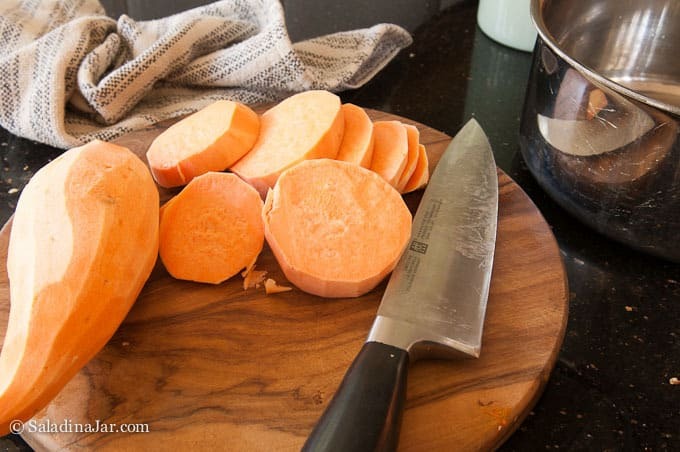 Peel and cut sweet potatoes in 1/2-inch slices. Place in covered pot with 6 tablespoons water. Cook over medium-low heat, stirring occasionally until potatoes are soft. Usually takes 20-25 minutes. Preheat oven to 400 degrees F. Prepare a cookie sheet by covering it with parchment paper, a silicone mat or greasing it well. Mix egg whites, water, and salt with a fork until frothy. Add Worcestershire sauce, paprika and cayenne. Mix well. Spread chopped pecans on a piece of wax paper or a plate. Make sweet potato balls using a spring-loaded ice cream scoop. I like balls between 1/8 to 1/4 cup size. (Surgical gloves are really helpful here.) Drop balls one at a time into egg white mixture with a slotted spoon making sure the whole ball gets coated. 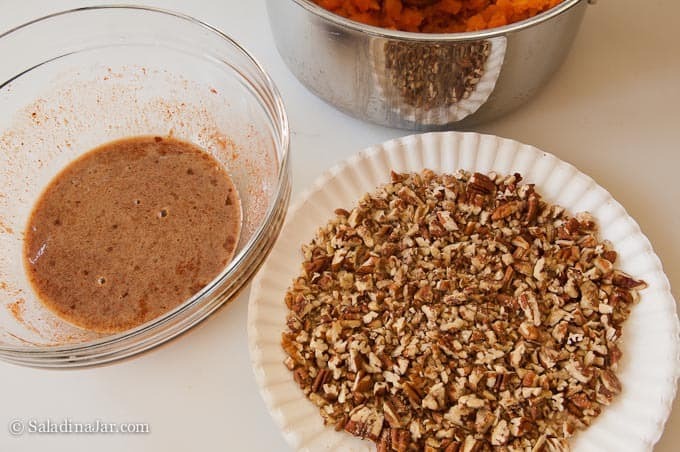 Then cover ball with finely-chopped pecans. Place on prepared cookie sheet. Brush with melted butter. Bake for 15-20 minutes or until nuts become toasty and balls are heated through. If you have any of the egg white mixture left over, here's an idea. Add a tablespoon of melted butter to the mixture and stir. Add more pecans--maybe 1/2 cup. Pour onto a greased or silicone mat-covered baking sheet. Bake at 350 for 15 minutes or until toasty. These are so good crumbled over a salad. Or.... you could just eat them straight up like I do. The nutritional estimates on this recipe may be a little high because you will probably have a little bit of the egg mixture and butter left over after making the balls. A version of this post was originally published in December 2009. It has been updated with new pictures, and a revised recipe to reflect how I make it now. I have never heard of Swerve. Where do you buy it? Cannot wait to make this for my family. Wishing you and your family a very Happy Thanksgiving. You can get it at places like Whole Foods and Sprouts in our area. It’s also available on Amazon (usually cheaper) here. It is a little pricey so I save it for special occasions. Oh my gosh, this looks amazing! I tell you your site always makes me so hungry when I’m done visiting it. Anyway, I’m making these ASAP. Our son-in-law is the only one in our family who likes sweet potatoes as much I do. Actually, he likes them better since he orders sweet potato fries instead of french fries (are they only in Louisiana?) Anyway, he will be surprised when I make these! Those look SO good. I love all things sweet potato! Will have to try this one for sure! Looks very yummy, Paula (aka “Pioneer Woman II”)!!!!!!!. Can’t wait to try them. 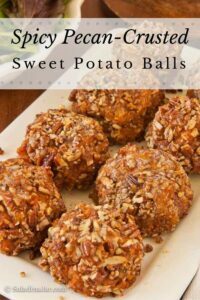 These sweet potato balls look great and so appealing. I am not sure I have the time right now to make them but I will be putting this on my list of must do’s. Thanks for adapting the recipe. Think I will try your version next time. Had not planned to make these for Christmas but yours look so good, may have to try your version. Those look delicious! I love sweet potatoes, but, unfortunately, I am the only one in my family who does, so I don’t get them very often. On another note, I buy my hazelnuts in 1/2 cup packages. They are already shelled and somewhat chopped. I seldom use hazelnuts (I use more almonds and pecans) so buying them ready to use makes more sense to me. Thanks for dropping by my blog! I love sweet potatoes. These just look extremely gorgeous and delicious. They would be so good for parties. I love them. Thanks for sharing.